Many things bring smile to my little girl’s face. One of them causes just that extra special smirk, and by extension leaves just that extra special squeeze to my heart, and it’s Eataly’s pizza. She usually sits right at the cold and shiny marble counter, inches away from the pizza master, carefully observing his craft and every move. Her and the pizza master Google-eye each other, he makes her feel important, speaks to her in Italian, heart shapes her pizza and takes much care to impress her with his dough bouncing, fiery oven paddle flipping, and his boyish charms. She tries to give almost equal amount of attention to her bread and olive oil plate, or the sous-chef doing food prep, but the Italian pizza master with the paddle usually takes over. One day recently, my daughter wasn’t feeling well, and all she wanted to eat was his special pizza. 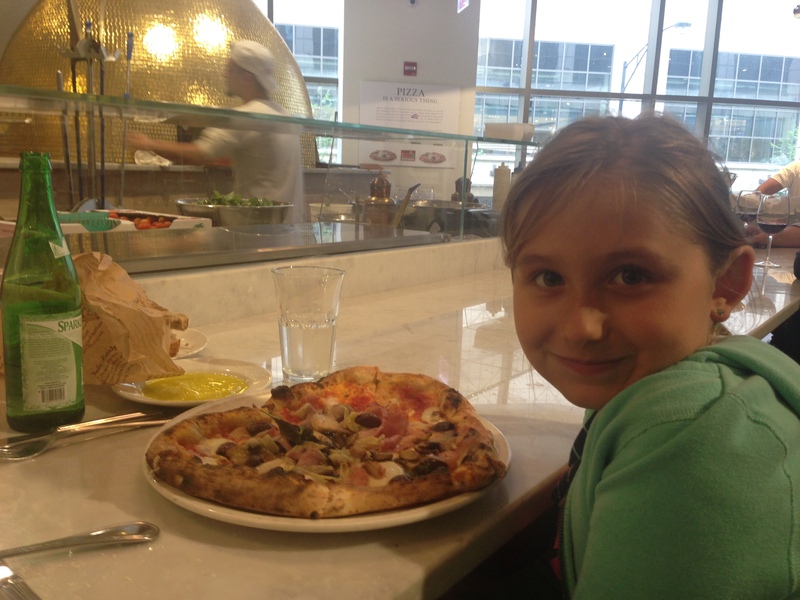 Knowing how seriously the pizza master takes his craft, and how Eataly feels about taking things to go, I cringed, sighed, but decided that her extra smile was worth the judgement I was about to face. I hesitantly approached the counter and ordered a pizza to go. I paid and stood on a side for only few minutes, it usually takes just minutes for a pizza to be made and baked. Mr pizza master was fuming! I could feel his frustration, his ego was inflating like a balloon as fast as one could fill it with helium, right there above his head, and was about to burst and take over his and someone’s day. He huffed and puffed, angrily grabbing the dough, stretching it with disdain, composing ingredients of Sashimi’s special pizza irritably and without love, spiced with under chin mumbling, directed at me and my ignorant decision to disrespect his art. I understood how he felt, his peers understood how he felt, they even gave him comforting pets on his shoulders during this farce. He was disappointed, he knew what his pizza would look or feel like after few minutes in the box, I did too, but my baby wanted it and I was willing to diss his art for her. I didn’t say a word, I just took the judgement and passive aggressiveness along with my pizza box and disappeared leaving his stink-eye behind me. I’ve been thinking about this man, judging harshly, through me, one of his biggest, sweetest, and arguably cutest fans, because in that moment, he was unable to master ego and his sense of pride. …I remembered someone once said to me, a bad day for the ego is a good day for the soul. It now made perfect sense. I recently did something similar to a friend. I allowed my pride and ego to inflate, and my feelings to overtake with a gusto. Just like the pizza master, I was wrapped up in my own pride and feelings, too much to notice that someone is, usually, when feeling well, a loyal and true friend and a real fan. So just like the pizza man, I judged and I fumed. I even got few pats of support on my shoulders, but actually I was selfish and egoist in those moments. Unfortunately, just like wisdom doesn’t come over night, and we don’t just wake up one day clear on everything and wise, sometimes a bad ego day does not instantly equate to a good soul day. Sometimes, by the time the ego bursts, the heart opens up, and the soul takes over, you have already lost your loyal fan or a true, sincere friend. Sometimes the damage is done and could never be undone. …Yet, sometimes the ones with the purest hearts and wisest souls, the innocent and unspoiled ones among us, the true, kind, loyal, wonderful little beings, who are here to show us and to remind us of what matters, who matters and why they matter most, they bravely rush in with their brilliant arrows of love and wisdom, they burst our ego balloons into million little rubber bits, right before our eyes, and startle us into being awake and letting ego go. They are what people call miracles in our lives, the ones that teach us every step of the way, that bring us fastest, deepest and most powerful lessons to learn and ones that award us with love, wisdom, flexibility and tolerance. Sashimi and I will continue to visit Mr. pizza master and continue to enjoy his art, still in awe, still his fans. We understand him, and forgive him, and we hope that some day, he will be able to do it too.